Product prices and availability are accurate as of 2019-04-21 19:01:42 UTC and are subject to change. Any price and availability information displayed on http://www.amazon.com/ at the time of purchase will apply to the purchase of this product. 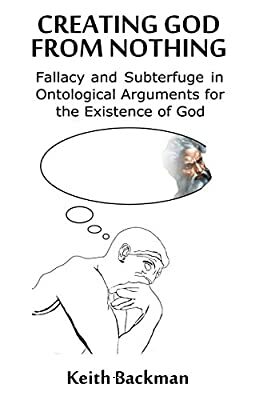 Author Bookstand is proud to offer Creating God from Nothing: Fallacy and Subterfuge in Ontological Arguments for the Existence of God by Bookstand Publishing. Bookstand Publishing offers books by the best indie authors throughout North America and the world. Bookstand Publishing is dedicated to offering original content to a broad audience and promoting great authors, literacy, and freedom of expression. Creating God from Nothing: Fallacy and Subterfuge in Ontological Arguments for the Existence of God has generated a lot of interest and excitement and we think it would be an excellent addition to your library. In his second philosophical inquiry, Keith Backman closely analyzes two versions of the Ontological Argument for the existence of God: the original argument as formulated by Anselm of Canterbury in the Eleventh Century, and the Twentieth Century variant proposed by Alvin Plantinga. He unearths and explores fallacies that have not been previously recognized in those arguments. One fallacy entails the improper treatment of characteristics featuring implicitly infinite magnitude as if they possessed a definite measure. Both philosophers indirectly propose that attributes of infinite magnitude should be manipulated, augmented, or aggregated so as to obtain an entity with a magnitude distinguishable from the infinitely great properties of its starting components. The author concisely and lucidly illustrates the error of this kind of reasoning, and its consequences. 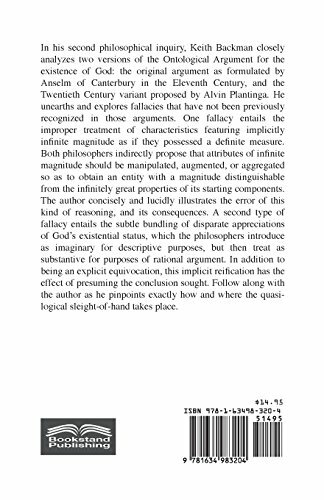 A second type of fallacy entails the subtle bundling of disparate appreciations of God's existential status, which the philosophers introduce as imaginary for descriptive purposes, but then treat as substantive for purposes of rational argument. In addition to being an explicit equivocation, this implicit reification has the effect of presuming the conclusion sought. Follow along with the author as he pinpoints exactly how and where the quasi-logical sleight-of-hand takes place.